Scramble has been on a bit of a hiatus. 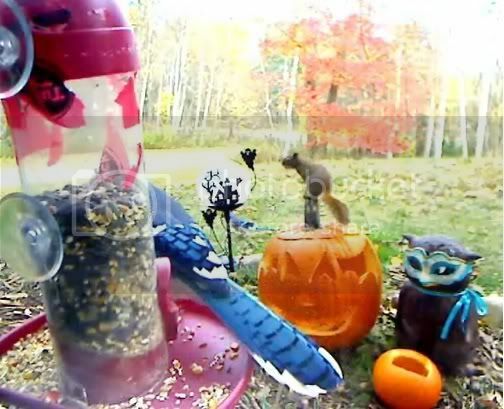 I hadn't seen him causing mischief on the cam, so I figured maybe he had moved on to bigger and better feeders..
That was until I put the acorns out! 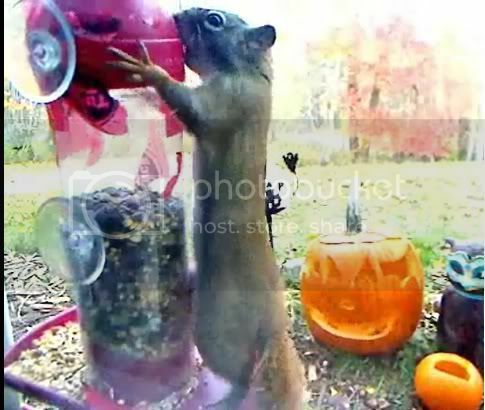 Not only did he clear out the entire pumpkin on the first day, but he then moved on to the feeder, attempting to knock it down. "Argh! What is this stuff?" He was quite entertained by the jacoklantern and used it's stem as a perch as he glared at the bluejay occupying the feeder. As soon as the coast was clear, he made his move and attempted (in vain) to remove the cover from the feeder. Luckily (for me and the birds) some of the heavy-duty tape still remained on the cover and he eventually lost interest.